Born to Ludwig and Anna Weyl in Elmshorn, Germany on November 9, 1885, Weyl showed great promise in mathematics even as a young boy. He went to the University of Munich in 1904, and studied mathematics and physics both there and at the University of Göttingen, where, under the supervision of David Hilbert, he received his Ph.D. in 1908. French mathematician and author Jean Dieudonné called him the most gifted of all Hilbert’s students. Weyl began his teaching career at Göttingen, where he had a significant impact on the field of mathematics. His first book, Die Idee der Riemannschen Fläche (The Concept of a Riemann Surface), published in 1913, grew out of a lecture course he taught on Riemann surfaces. That same year he was given a chair in mathematics at the Federal Institute of Technology in Zurich. Einstein was also in Zurich at this time, further spurring Weyl’s interest in physics. Weyl married Helene Joseph in 1913. Known as Hella, Helene had been a student of philosopher Edmund Husserl in Göttingen. She worked as a translator and a philosopher. 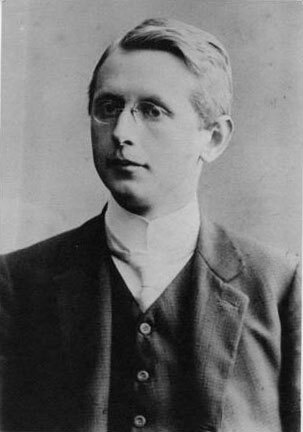 Husserl had been influential in Hermann Weyl’s life as well, as had the field of philosophy, which he first encountered at the age of fifteen. The couple had two sons, Joachim and Michael. In 1930, Weyl was appointed to the chair of mathematics at Göttingen following Hilbert’s retirement. Weyl wanted a comfortable, secure living for his family, and the means to educate his children. Had the political climate remained unchanged, he might well have remained at Göttingen University for his entire career. Abraham Flexner, founding Director (1930-39) of the Institute for Advanced Study, had made overtures to bring Weyl to the Institute beginning in 1932, but Weyl was uncertain about making such a move. His instincts were that he should remain at Göttingen. Although Hitler lost the German presidential election in April of 1932, the mood of the country was shifting and the situation at the university was deteriorating quickly. A serious concern was that Weyl’s wife Hella was Jewish, and their sons were considered Jewish by the German government. “When I was offered a position at the Institute early in 1932, there was of course the additional complication that the potential fate of Germany still hung in the balance,” Weyl wrote in 1949 in a letter to noted German historian Felix Gilbert (Institute Faculty member, 1962–91), when Gilbert was considering joining the Institute. Weyl vacillated about moving to the United States, sending a series of cables accepting, declining, and then “irrevocably” accepting the position at the Institute. One week after making this commitment, following the death of his mother-in-law and an outbreak of influenza that affected his entire household, Weyl again cabled Flexner to decline the appointment, which had already been approved by the Board of Trustees. At the April 1933 Board meeting, Weyl’s appointment was annulled and John von Neumann was appointed to the mathematics Faculty. By that time, circumstances in Germany were becoming dire. By April of 1933, the once-preeminent Mathematics Institute at Göttingen had been substantially dismantled. The Nazis had dismissed all Jewish civil servants, which included university faculty, except those appointed before 1914 and those who had served in World War I. In addition to those who were let go, some faculty members resigned in protest, leaving very few members remaining. Eighteen faculty members had been fired or driven out. The educational system in Germany was swiftly being undone. All this took place while Weyl was convalescing from a bout of depression in Zurich. Weyl recognized that his options were quickly shrinking, and that returning to Germany might make it impossible for him to ever leave again. If he was to escape the Nazi regime, he realized he must act quickly. Weyl began exploring an opportunity in Madrid, but with few other options, in late April he returned to Göttingen in desperation. With so many faculty members dismissed, he was forced to become director of the mathematics program. As conditions worsened in Germany, Weyl realized that he could not continue to work there. He investigated other possibilities for an academic position while maintaining contact with Veblen. Made aware of Weyl’s situation, Flexner extended him another offer to join the Institute in September of 1933 via an intermediary in Zurich, and in October, Weyl and his family were able to reach America without the German government learning of the offer. Weyl joined the Faculty of the Institute in 1933 and served until his retirement in 1951, when he was named Professor Emeritus. At that point, he began splitting his time between Princeton and Zurich. 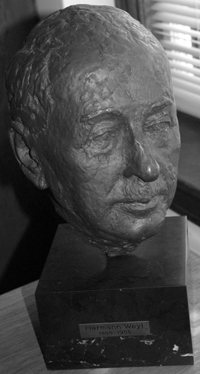 His wife Hella died in 1948, and two years later he married the sculptor Ellen Lohnstein Bär from Zürich. It was in Zurich that Weyl died unexpectedly on December 8, 1955, the victim of a heart attack suffered on his way to mail a letter to Institute Director J. Robert Oppenheimer, reporting that he received a provisional copy of the “Selecta Hermann Weyl,” from ETH.